Wally, in the front, with Abby in the back. When I was little, my mom did not like dogs, certainly not dogs in the house-dogs. When I was in third grade, my mom went off to Oklahoma for a week. My dad took vacation time to watch my sister and I. As soon as my mom was on the plane, we were off to a breeder and purchased a four-month old, Miniature Schnauzer puppy. At the time, I thought this was by far the biggest event ever. We were finally getting a dog. We were surprising my mom. Biggest secret ever! I realize now that my father would have never, ever purchased a dog without my mother’s approval but that knowledge was year’s away from occurring to me. So, I had my first dog. His name was Scamp. He endured a lot with me. Croquet sets, lawn chairs with brooms, tires stacked sideways and anything else I could find would be set as a jump course. Of course he was not a horse, but there was no lack of trying to make him into my version of one. He weighed 15 pounds but he tried hard. He was the first of many. I went from small to large. I developed an affinity for Dobermans. I owned them and for a while, bred them, striving for great temperament and conformation. I have owned many types of dogs over the years-from a huge Irish wolfhound (still so dear to my soul) to tiny Yorkies and Shih Tzus. I would be hard pressed to tell you my favorite. 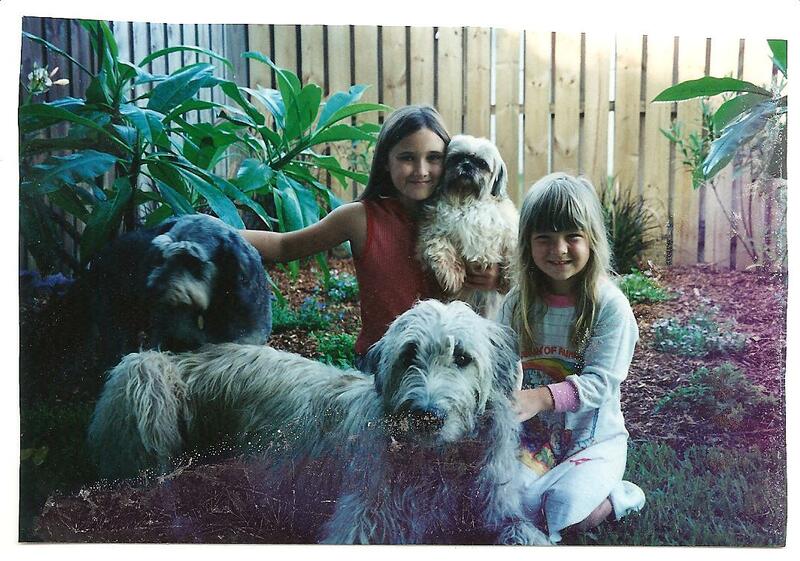 The wolfhound was my most challenging dog. We started off the worst in our obedience class and ended up first after six weeks of hard work. I am proud that Ryan and Amber took my advice to get a “gentle giant” as they are called. I love the miniature Dachshund I own now-she is currently one of my favorites. Obviously, I am all over the place with what I love. I like the Dobs because they are smart, have short hair, no tails and don’t slobber. My truest companions have been Dobermans. I am a supporter of the Doberman rescue (here in Houston it is HADR.org). Wally, who I lost this last year, was my best boy for so many years and came from that rescue. 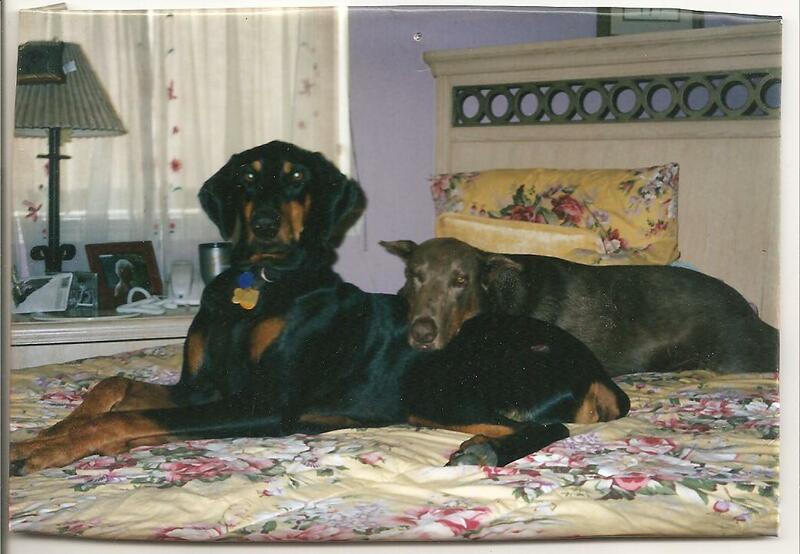 Abby, also from the Doberman Rescue, was one of the finest dogs I have ever owned. She was six when she came to our home. Considered by many to be too old to adopt, we enjoyed eight more great years with her including earning her AKC-Good Citizen designation. I try to get rescue or adoptive animals whenever possible. We have supported so many over the years. I have six (I know that is a crazy number) dogs right now. Two just showed up and joined our family. When you live in an area of low people population and a high animal population, there are not the resources for lost, starved or stray animals like there are in the city. As an animal lover, I cannot stand to see one hurt, starved, or on its own. I am a sucker. I understand that. Fortunately for the animals there are several of us that exist. I have threatened multiple times to take an animal in the dark of night and drop it off near my friends, Gaylyn and Becky’s houses. They are animal lover like I am and would certainly take care of anything that showed up at their door. So okay, I have never done that-but know an animal could count on them if needed. I love dogs. I love all kinds of dogs. There are some better fitted to my life-style but someone who can simultaneously own a Shih Tzu and wolfhound obviously just enjoys the company of dogs.